One of the greatest benefits of playing poker online is your ability to see more hands, more situations and more money. This enables you to be more patient, wait for solid opportunities and strike when those chances arise. If you want to double, triple, or drastically increase the hands you see, then it is time to multitable. Just like the name suggests, you are able to play multiple tables at once. This is one of the big steps to profitability online. One of the main differences of playing poker online that you cannot get when playing Video Poker. With proper technique and discipline, the more hands you see, the more money you will make. I recommend taking it pretty easy for your first multitable session. Only play two tables, and reduce your stakes. If you are a $1-$2 player, try out two $0.50-$1 tables. Conversely, if you are playing SnGs, reduce the action and it will remove a lot of the stress and anxiety. Doubling the action doubles the concentration. Turn off the TV and focus on the poker game. As your game grows and you start playing more games at once, be sure to enable your online poker audio settings. The ping of action will be a good reminder of when to act. Make use of the “fold to any bet” or “check/fold” buttons. This will save you timely clicks and give you more time to think about tougher decisions. When multitabling, being a tight/aggressive player is the way to go. Stick to premium hands and don’t be afraid to fold. That being said, it’s fine to focus on a hand once it gets necessary. You are multitabling to give yourself opportunities like that, not to stress yourself out. 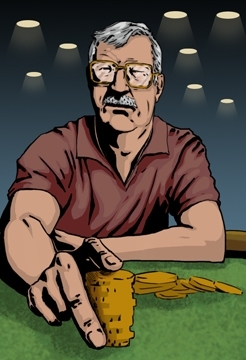 As you gain more experience, try adding more tables (while dropping your stakes). This slow growth will prepare you for the big time – when you’ve got 3 monitors, 16 tables and stacks of cash.